His relations with Rome still on a warming path, the Russian Orthodox Patriarch Alexei II died unexpectedly overnight aged 79. Head of Orthodoxy's largest branch since 1990, Alexei led the return of the 100 million-member church to the center of national life in the years following the Soviet Union's collapse. A hard-liner who rose through the hierarchical ranks at a young age and initially saw Catholicism's first steps on Russian soil as an act of aggression, the rapport between the Moscow patriarchate and the Holy See -- a priority of the reigning pontiff -- has markedly improved over recent years, even to the point that a meeting between Alexei and Benedict XVI had appeared increasingly likely over the last several months. I was profoundly saddened to receive news of the death of His Holiness Alexy II, Patriarch of Moscow and of All the Russias, and with fraternal affection I wish to convey to the Holy Synod and to all the Members of the Russian Orthodox Church my most sincere condolences, assuring you of my spiritual closeness at this very sad time. In my prayer I beseech the Lord to welcome into his Kingdom of eternal peace and joy this tireless servant, and to grant consolation and comfort to all those who mourn his passing. Mindful of the common commitment to the path of mutual understanding and cooperation between Orthodox and Catholics, I am pleased to recall the efforts of the late Patriarch for the rebirth of the Church, after the severe ideological oppression which led to the martyrdom of so many witnesses to the Christian faith. I also recall his courageous battle for the defence of human and Gospel values, especially in the European Continent, and I trust that his commitment will bear fruit in peace and genuine progress, human, social and spiritual. 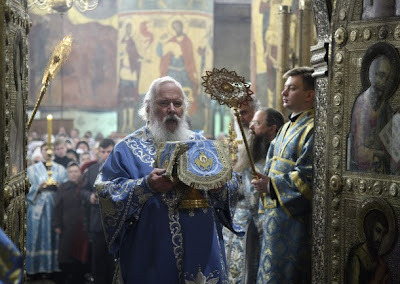 At this sad time of loss, as his mortal remains are consigned to the earth in the sure hope of resurrection, may the memory of this servant of the Gospel of Christ be a support for those who are now in sorrow and an encouragement for those who will benefit from his spiritual legacy as leader of the venerable Russian Orthodox Church.